If you have never been to Tanaka Farms you are missing out! End summer with a fun tour - we will be going back soon too. Local, farm fresh, farm to table, fruits, veggies and so much more local here in Irvine off of University and Strawberry Field. 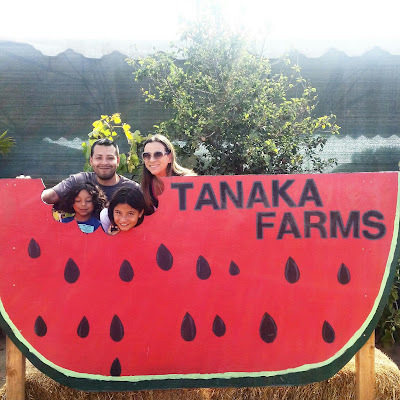 At Tanaka Farms they offer a lot more than fresh food... the tours are perfect in every way. 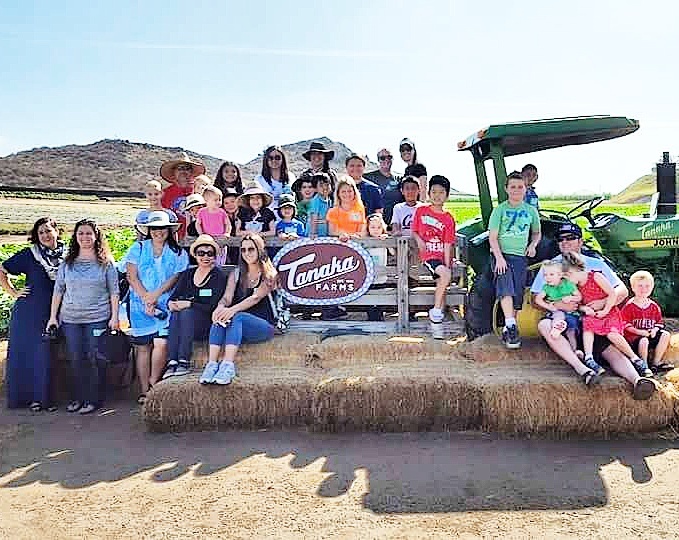 From the fresh fruits and veggies you get to sample along the ride, in a huge tractor wagon, you also get to take home the food your tour is about. Our group did the watermelon tour and it was so much educational fun. 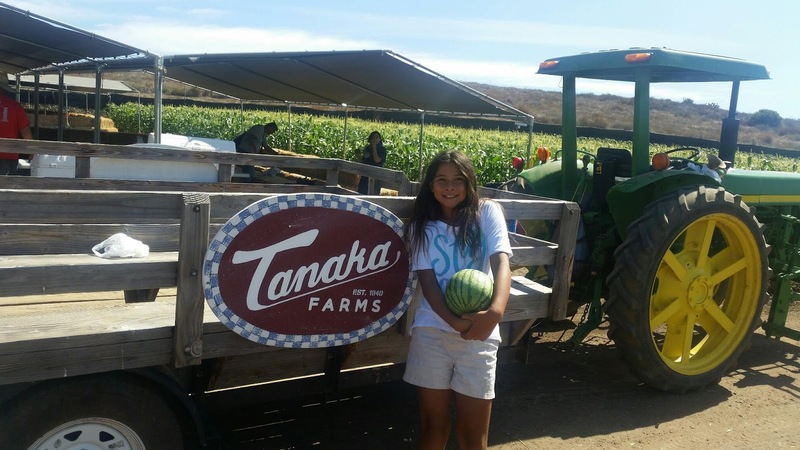 We learned all about the history of Tanaka Farms and about the types of food grown on their land. 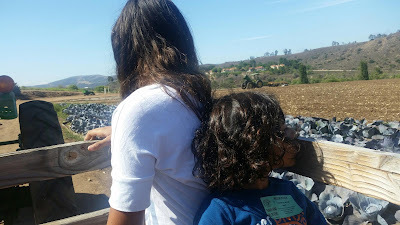 My kids loved riding the tractor through the farm. 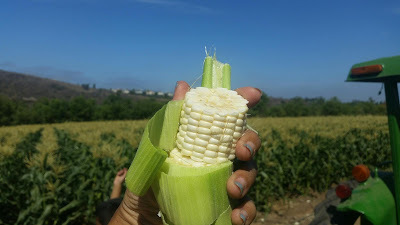 The looked out and listened to all the details about what was being grown and when it would be ready! Along the ride we sampled fresh cilantro, green leafy romaine, tomatoes and raw corn, that surprisingly was amazing...or as my daughter says.. "tastes like candy". Yeah I know right? ! 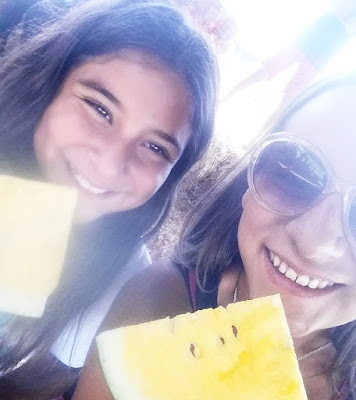 We had fun learning about the different kinds of melons and what they taste like. At the end of the tour we were able to pick and take a watermelon home, after of course, tasting a few of them. Yellow, seedless, red and so good. It was a blast on the farm. My kids did not want to leave. They did however enjoy loading up a basket of fresh goodies from their market stand to take home. We bought fresh corn, tomatoes, cherry tomatoes, cucumbers, avocados, yams, sweep potatoes, salsa, leafy greens, carrots and some other random goodies! Oh, and our bill for all that less than usual too! Get all the info on booking a tour and seeing the farm here!